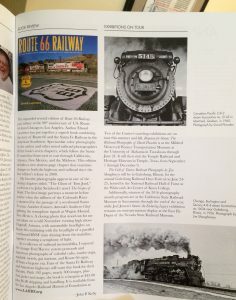 Railroad Heritage, the quarterly publication of the Center for Railroad Photography and Art, gave the expanded second edition a great review in its summer 2017 issue, calling it a “superb book combining the story of Route 66 and the Santa Fe Railway in the American Southwest” with “spectacular photography by the author and other noted railroad photographers.” Click the image to read the review. We’re also thrilled to announce that Route 66 Railway has received a scholar’s award from the Conference of California Historical Societies! The award letter states “the book is a well-woven history of the famous highway, the railroad, and the communities along the way. The photographs in the volume are exceptional and add to the story.” The award will be presented at the Conference’s annual meeting in Lincoln, Cal., on June 24. Below are samples of the reviews that Route 66 Railway received following its original release in late 2008. One of our favorites is from Ron Warnick of Route 66 News, a major news blog for Mother Road fans — click HERE to read his thoughts. “Lawrence is a master photographer and each page is stunning in its visual content,” editor Bob Moore wrote in the Winter 2008/2009 issue of Route 66 Magazine. “Lawrence lavishes the reader with a superb chronicle in both vivid text and stunning photographs,” wrote David Lustig in the April 2009 issue of Railroad Model Craftsman. “This is one sweet book,” said editor Steve Barry in the February 2009 issue of Railfan & Railroad magazine. Finally, Gene Rutledge called the book “magnificent” and a “fabulous piece of work” in the first quarter 2009 issue of The Warbonnet, published by the Santa Fe Railway Historical Society. Author Lawrence was interviewed by Arizona’s National Public Radio affiliate KNAU-FM in September 2009 — CLICK HERE to listen to the four-minute interview (be sure to read the introduction). In January 2009 the San Bernardino County Sun covered the book and its local author. R66R was also covered in the Monterey County Herald, the Salinas Californian, Fontana Herald-News, and “The Author’s Network” internet radio show. Lawrence was also quoted in a 2009 Preservation Online article, “Route 66 Hipsters.” CLICK HERE to read the piece.